Samaneh Zandian got her PhD in ELT and Applied Linguistics in November 2015 at Centre for Applied Linguistics, University of Warwick. She began her postgraduate research study in October 2011 after graduating with distinction from the Centre for Applied Linguistics’ MA program in English Language Teaching. She was also a research assistant in a project at this center which investigates the predictive validity of TOEFL iBT ® scores and their use in informing policy in a UK university setting. Before moving to England in 2010, she was a language teacher in Iran for 8 years, teaching English to different age groups. 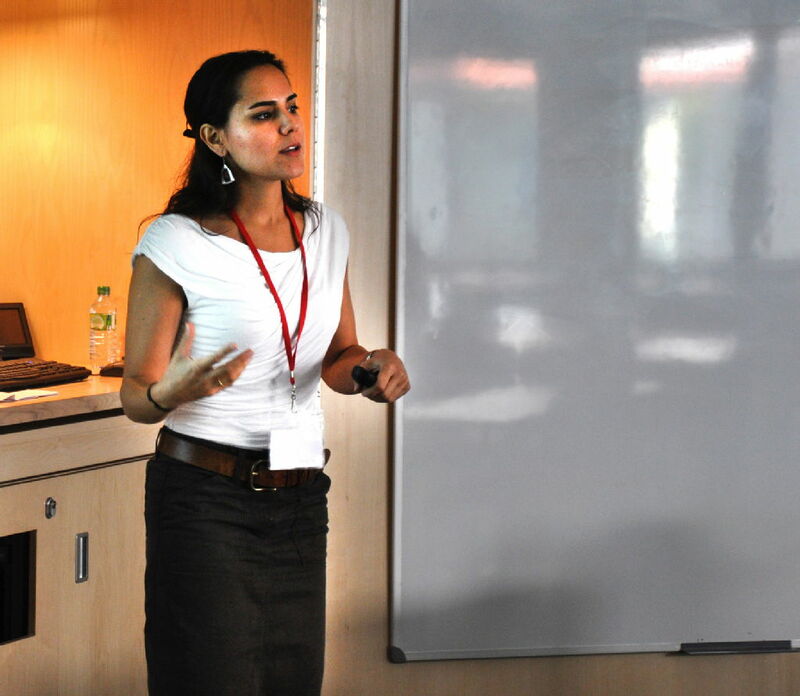 Samaneh Zandian is interested in the processes of adaptation in relation to children sojourners. She is also interested in exploring the advantages and limitations of using innovative participatory research methodologies with children. Globalization has brought a wide range of cultures into close contact; consequently, intercultural interaction has become a common feature of modern life. The stress and coping approach sees cultural contacts as a series of stress-provoking life changes that require coping responses. Children as part of societies are no exception in this regard. This study aims to explore some aspects of Iranian children’s perception of intercultural encounters and transitional experiences. Findings of this research can provide unique and vital data for educational purposes in this country. Pinter, A. & Zandian, S. (2015). '"I thought it would be tiny little one phrase that we said, in a huge big pile of papers"- children’s reflections on their involvement in participatory research'. Qualitative Research 15/2: 235-250. Zandian, S. (2014). 'Developing intercultural education in Iran: starting with young foreign language learners'. In J. Enever, E. Lindgren, & S. Ivanov (Eds. ), Conference Proceedings from Early Language Learning: Theory and practice in Umeå 14 June 2014 (pp.138-142). Umeå: Umeå Universitet. Pinter, A. & Zandian, S. (2014). '"I don’t ever want to leave this room" - researching with children', ELT Journal, 68(1), 64-74. Zandian, S. (2013). 'Participatory activities, research and language classroom practice'. In M. Allstrom & A. Pinter (Eds. ), English for Young Learners-Forum: Proceedings from the Conference in Uppsala 19 June 2012 (pp.133-142).Uppsala: Uppsala Universitet. Zandian, S. (2013). Children's experience and perception of adaptation and intercultural encounters. In T. Pattison (Ed. ), IATEFL 2012: Glasgow Conference Selections (pp.120-123). Canterbury: IATEFL. Zandian, S. (2011). 'A personal reflection on the impact of researching children on my own professional development'. ELTED Journal, 14, 32-36. Assi. M. & S. Zandian (2010). 'Analysis of the usage of basic vocabulary in Persian translational and non-translational children’s literature'. Translation Studies, 8(32), 87-100. AILA World Congress 2017, Universidade Federal do Rio de Janeiro, Rio de Janeiro, Brazil, 23-28/07/2017. The Young Language Learners Symposium 2016, University of Oxford, 6-8/07/2016. 50th Annual International IATEFL Conference, Birmingham, UK, 14/04/2016. Presenters: Chris Kennedy, Shahrzad Ardavani, Parvaneh Tavakoli, Samaneh Zandian, Susan Heidarishad. Guest Speaker, Department of Education, University of Bath, UK, 10/02/2016. 48th Annual Meeting of BAAL, Aston University, Birmangham, UK, 3-5/09/2015. Global Governance GRP PhD Conference, University of Warwick, Coventry, UK, 13/07/2015. Iran and the West: Converging Perspectives, University of Warwick, Coventry, UK, 1–3/07/2015. iMean 2015, University of Warwick, Coventry, UK, 9-1/04/2015. Oral Presentation: "‘We can talk with them in English. It’s the main language, and everyone should know it!’- Young language learners in Iran and their perceptions of intercultural interaction"
14th IALIC Conference 2014, University of Aveiro, Aveiro, Portugal, 28-30/11/2014. Downscaling Culture: Revisiting Intercultural Communication International Conference, Cardiff University,Cardiff, UK, 18-19/09/2014. Oral Presentation: "‘I think we- children never thought about such things!’_ about time to introduce intercultural education in Iran"
47th Annual Meeting of BAAL, University of Warwick, Coventry,UK, 4-6/09/2014. 14th International Conference on Language and Social Psychology (ICLASP14), Honolulu, Hawai'i, USA, 19-22/06/2014. Early Language Learning: Theory and Practice in 2014, Umeå university, Umeå, Sweden, 12-14/06/2014. 46th Annual Meeting of BAAL, Heriot-Watt University, Edinburgh, Scotland, 5-7/09/2013. Oral Presentation:"Researching Children to Child Researchers"
16th Warwick PG Conference in Applied Linguistics, University of Warwick, Coventry, UK, 25-26/06/2013. Symposia Iranica, St. Andrews University, Scotland, UK, 13-14/04/2013. 15th Warwick PG Conference in Applied Linguistics, University of Warwick, Coventry, UK, 26-27/06/2012. Oral presentation: "Some considerations in research with children"
English for Young Learners-Forum 2012- Uppsala, Sweden, 19/06/2012. 46th IATEFL Annual Conference and Exhibition – Glasgow, Scotland, 19-23/03/2012. Oral presentation: "Children's experience and perception of adaptation and intercultural encounters"
TEFL Forum ‘Linking lives and classrooms for Language teaching and learning’, University of Birmingham, UK, 25/11/2011. Poster presentation: "Given that English is an international language, is there any role for immigrant literature in teaching?" 14th Warwick PG Conference in Applied Linguistics, University of Warwick, Coventry, UK, 28-29/06/2011. The 5th Postgraduate TS Conference on Sociocultural Studies in Translation, Allameh Tabataba’i University, Tehran, Iran, 14/12/2009. ELLTA Meeting, Centre for Applied Linguistics, University of Warwick, UK, 28/11/2012. AILA Solidarity Award to attend the AILA 2017 World Congress. 2016 Doctoral Researcher Award (DRA)- Honourable Mention Award in category of Management & Social Sciences offered by Association of British Turkish Academics (ABTA). IALIC conference scholarship 2014 offered by International Association of Languages and Intercultural Communication (IALIC). The Inaugural Tamar Murachver Award for Most Outstanding Student Paper 2014 offered by International Association of Language and Social Psychology (IALSP) in 14th International Conference on Language and Social Psychology (ICLASP14).